UF HealthStreet invites community members to a discussion about the potential for intermittent fasting, “keto” diets and physical activity to optimize well-being and longevity. 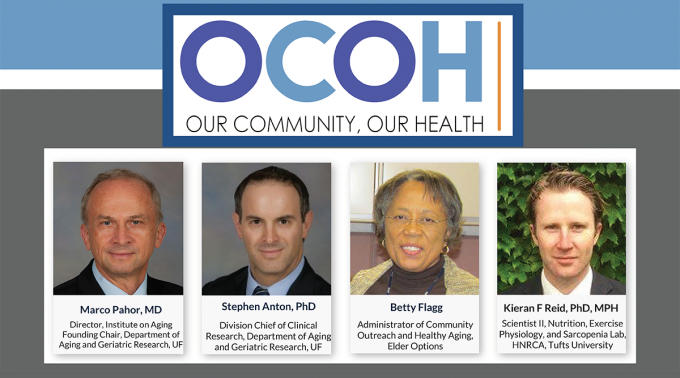 The next installment of the Our Community, Our Health town hall series, this event will feature researchers from the University of Florida and Tufts University in an open forum that the community can join in person or online. Our Community, Our Health: Healthy Aging – Evidence-Based Lifestyle Interventions will be livestreamed and online audiences can submit questions through the livestream website or via Twitter. Those in attendance at HealthStreet can join a reception with refreshments from 5:30-6 p.m. followed by the discussion from 6-7 p.m. Please RSVP at www.bit.ly/HealthyAgingRSVP for catering purposes. The moderator will be Marco Pahor, M.D., director of the UF Institute on Aging and founding chair of the UF College of Medicine’s department of aging and geriatric research. This event takes place 5:30-7 p.m. Tuesday, Jan. 22, 2019 at UF HealthStreet, located at 2401 SW Archer Road, Gainesville, and online at www.bit.ly/OCOHJAN22. RSVP now and share with your friends. For more information, contact Tamara Lowrey at 352-294-4871 or at tlowrey@ufl.edu.